How Lou Sees It: What is the Ovoid? Matt, thank you for taking time to answer a few questions. I think today is going to be the big day that you meet your goal and officially become funded! Very exciting! As I learned more and more about Chaosmos, I knew that it would be a game enjoyed by all of my friends and family. The game concepts are simple and easy to learn, but the game provides a plethora of strategies. I really like that the game has so much player interaction. A lot of games these days seem to lack that element, but Chaosmos relies on that (in my opinion) and that is what makes the game seem so entertaining to play. The game has such great components (board, chaos clock, miniatures, cards) and I really like the artwork too. 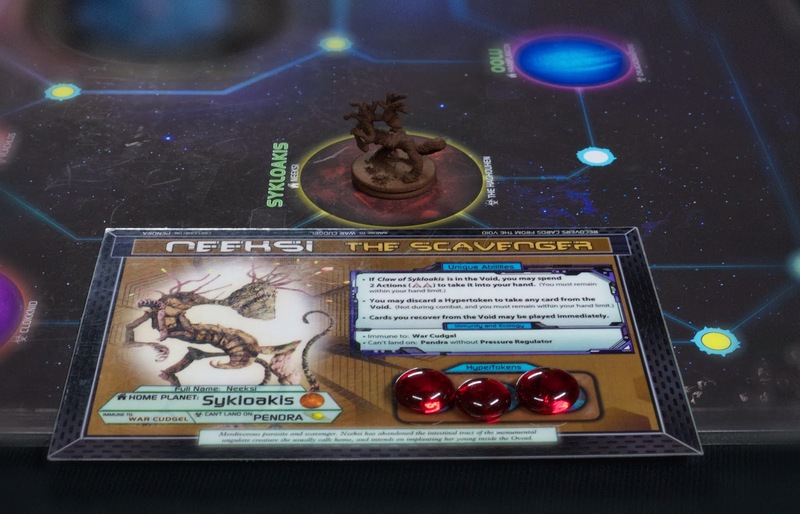 You have the envelope mechanic, 8 different alien races with special abilities, and did I mention cool looking miniatures? Q - From the title, the game sounds like it will be pretty chaotic. Can you tell us how you came up with the title "Chaosmos" and why you feel it represents the game well? Chaosmos is a mash-up of 'chaos' and 'cosmos', and it definitely represents our game well. In Chaosmos, you play an alien on a desperate hunt to find a mysterious artifact before the universe collapses. This narrative flows through to the gameplay, which has a very desperate, Cold War style mentality. You can't trust anyone but yourself, and you've got to deceive and outsmart your opponents if you want to succeed. Q - Which came first, the chicken or the egg? The Ovoid of course! It's the beginning and the end of the universe! Q - OK, so which came first with regards to Chaosmos, the theme/story or the game play/mechanics? The game is really thematic, and the mechanics evolved naturally from the narrative. It's an open-world game where players have a lot of choices, and the rules take a back seat, allowing player decisions and interaction to drive a natural story. Q - What inspired Chaosmos or helped contribute to the game mechanics and theme? 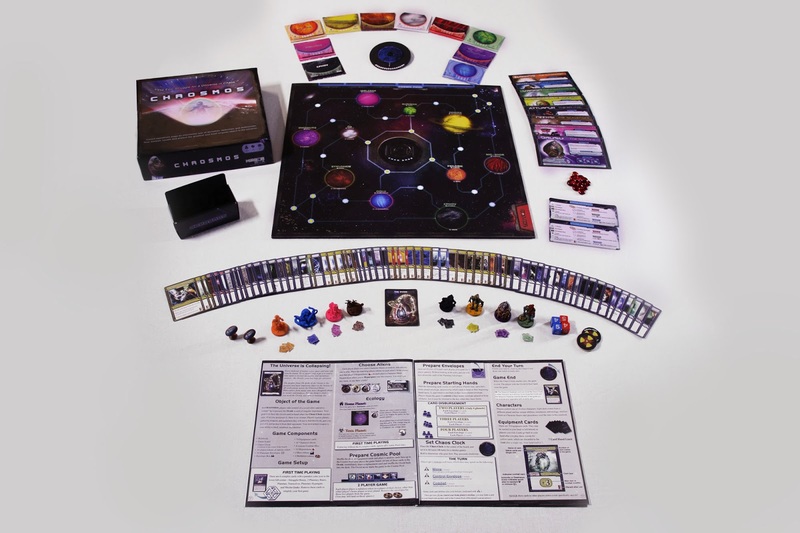 Chaosmos is unique in that it was inspired by a science fiction novel (Interstellar Pig, by William Sleator), and not by other board games. Our original mechanics, such as the planet envelope system, are a result of this inspiration. You can find more about the history of Chaosmos HERE. Q - What is your favorite color? Q - What sets Chaosmos apart from other games? 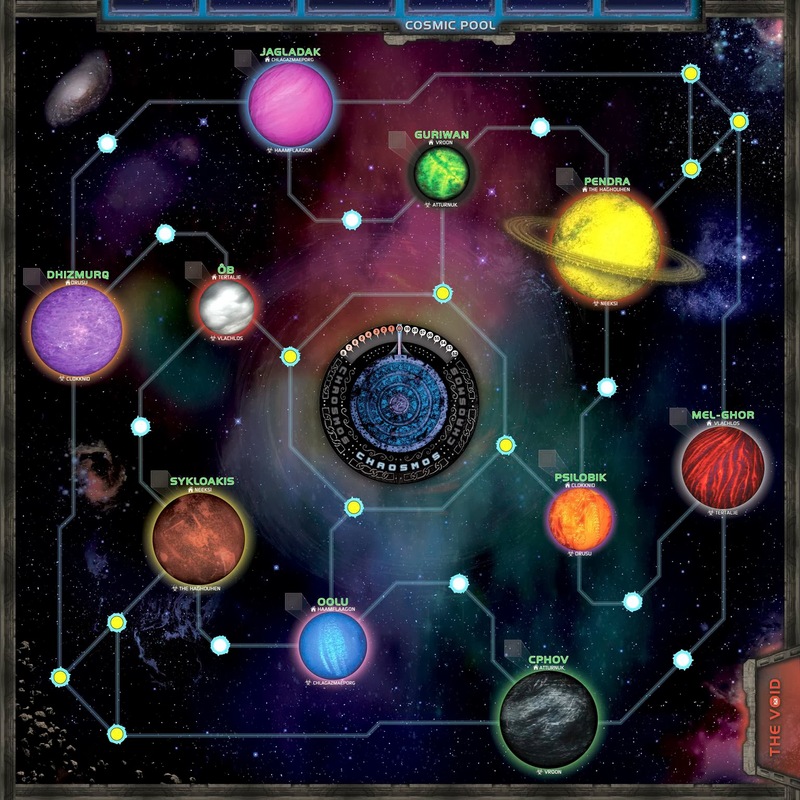 The mechanic that draws a lot of people to the game is the area-specific envelopes, where each planet contains cards that get moved around in a closed ecosystem - so cards continually shift in location and players must try to maintain a grasp on where things are and which strategies to use when. Q - What kind of people will enjoy Chaosmos the most? Chaosmos is for gamers who like to outsmart their opponents. If you have fun tricking your friends with those "AHA!" moments, you'll love Chaosmos. The game tells a story, building a narrative as players interact with one another. You're playing against the other players, not against the game. Q - Why should people choose to back Chaosmos now instead of waiting to purchase it from a game store shelf? 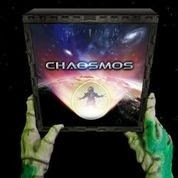 Kickstarter is the cheapest and quickest way to get a copy of Chaosmos! Everyone saves $5 off of MSRP, and will get their game as soon as it becomes available. We're also offering a Kickstarter exclusive bonus alien and limited edition bonus cards that allow you to play with a 5th player. Q - I really enjoy playing games with just my wife. Will this game work well with just 2 players? Yes! Chaosmos becomes even more of a game of psychological warfare when played with 2, since you can more easily hide cards away from your opponent. There's less combat, but more stealth and deception. Q - Pretend we live in a dystopian society which has just outlawed all board games other than the three chosen by the government. If you were the government, which three games would still be legal (and probably mandatory)? 1. Chaosmos – to show the citizenry what kind of chaos would ensue if they tried to revolt. 2. 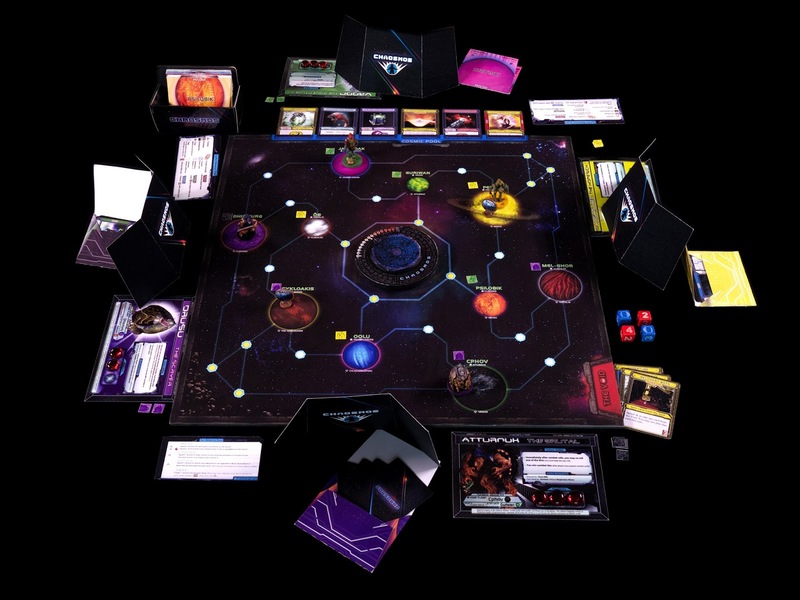 Twilight Imperium – to impress upon the people the might of the government's empire. 3. The Manhattan Project – to educate everyone on the government's massive and unstoppable nuclear arsenal. Q - After Chaosmos becomes a huge sucess, what's next? Anything in the works? An expansion? A different game under development you would like to give us a teaser for? Well, thank you Matt for your time. If Chaosmos looks like something you would be interested in or you would like to learn more, check out the project live on Kickstarter by clicking THIS link or by clicking on the banner found on the right side of the screen. You can also see more discussion on the Board Game Geek page.